“Through our extensive research, we found that specific egg production, processing and storage practices, in conjunction with specific nutritional supplements plays a crucial role in creating fresh eggs,” said Chuck Johnson,former Chief, Grading Branch, USDA, Agricultural Marketing Service and co-author of the study. The study analyzed 50 dozen Eggland’s Best eggs and 50 dozen generic eggs and found Eggland’s Best eggs had a greater value in egg white height, egg protein quality and yolk color when compared to generic eggs. The study contributes these findings to the enhanced production process Eggland’s Best enforces and the high-quality hen feed Eggland’s Best provides its hens, which includes more vitamins and minerals than ordinary hen feed. Industry guidelines allow generic eggs to sit in storage for up to 21 days before being packed. However, under the 27 points of quality and freshness program, Eggland’s Best eggs are placed in refrigerated storage within 24 hours of being laid and are packed within seven days. In addition, Eggland’s Best sets strict standards for its hen feed. The Eggland’s Best hen feed never contains any animal by-products or fat and contains higher levels of vitamins and minerals than industry standards to improve shell strength, which keeps Eggland’s Best eggs fresher overtime. Due to Eggland’s Best’s strict hen feed requirements, Eggland’s Best eggs contain 25 percent less saturated fat, 10 times the vitamin E, four times the vitamin D and twice the amount of omega-3 fatty acids than generic eggs. 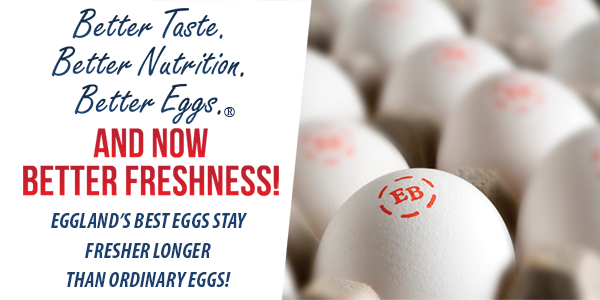 Plus, Eggland’s Best eggs contain 38 percent more lutein and provide a good source of vitamins B2 (riboflavin), B5 and B12.